With each new school year, campus IT departments are forced to accommodate the diverse needs of students and faculty. Embracing critical learning applications, managing recreational traffic and supporting the multi-device student makes today’s networks more complex than ever before. The adoption of online education continues to rise each year with more students enrolling in Massively Open Online Courses (MOOCs), participating in distance learning and taking advantage of digital classroom tools. In fact, the proportion of higher education students taking at least one online course is at an all-time high of 34 percent. But as popularity for these activities grows, so does the impact on higher education networks. Campus IT departments are under pressure more than ever to ensure students and faculty, whether on or off campus, can successfully access these courses and tools at all times. To guarantee a high quality of experience, you need to leverage your WAN optimization insights into how applications are performing across your entire network so you can appropriately prioritize and protect cloud-based applications and ensure that students and faculty can be productive anytime, anywhere. The day-to-day success of any higher education institution is obviously dependent on applications like course registration systems and online testing platforms. But what greatly makes a college attractive to a new student population is its ability to provide a high quality Internet experience outside of the classroom. Any student will argue that a big part of the campus experience is using online gaming apps, social media and streaming media services like Netflix and Spotify. Meeting students’ expectations for 24/7 connectivity requires a solution that is capable of delivering a fair share of network resources to all users across campus. Setting network policies that allocate bandwidth for recreational applications outside of peak classroom hours, improves the social experience for students without jeopardizing performance of strategic applications used for day-to-day operations. The average student now brings seven devices to campus. Whether connecting from laptops, smartphones, tablets or game consoles users are persistently accessing a variety of new applications all at the same time. And as BYOD has become mainstream, so has the associated challenge of increased bandwidth consumption. In order to manage the load and bring sanity to device and app chaos, IT managers need to better understand the context of the network activity. As the new school year approaches, it is vital to be proactive rather than reactive. Revisit your network policy and adjust the amount of bandwidth available based on application, user identity and location. Perfecting these contextual policies before the new semester begins can help you defer costly bandwidth upgrades and free up time and money for more important IT projects. Learning management systems, like Blackboard, are the most critical applications for higher education institutions. Registering for classes, checking grades, submitting assignments are all vital activities that ensure courses run efficiently and effectively. When these systems are down or response times are slow, the IT helpdesk is flooded with support tickets. Unfortunately most campus IT teams are understaffed and under-resourced which means it’s important for them to utilize the real-time monitoring, interactive analytics and purpose-built reports for your top learning and ERP systems that make it easy for busy IT departments to diagnose and resolve problems quickly for all applications, users and locations and ultimately increase student body satisfaction. Campus IT departments are under pressure to contain network operating costs while still delivering a high quality user experience for faculty and students on and off campus. But as students bring more devices and use more applications, IT is faced with the challenge of network congestion. Adding more bandwidth may help, but only temporarily. To slow down the ever-escalating need for bandwidth and defer costly upgrades, you need to maximize what you already have. Creating time, location and user based policies that control when and how much bandwidth is used for recreational streaming, will ensure your students can still have fun without negatively impacting the performance of your school’s critical applications. 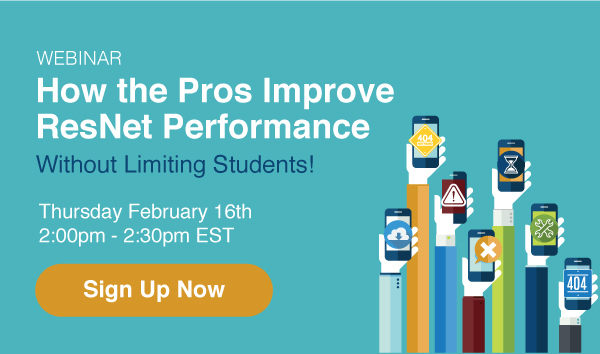 This year your school network will be flooded with ever-increasing volumes of traffic as students bring more devices, watch more streaming video and download more content than ever before. Defer costly upgrades and maximize your bandwidth investment with a solution that will allow you to identify and monitor unwanted traffic, guarantee performance of strategic applications and manage bandwidth allocation across your campus.